The heartwarming story of Lilian Singer, who starts life at the beginning of the twentieth century as the daughter of a prosperous middle-class Australian family and ends it as a cheerfully eccentric bag-lady living on the streets, quoting Shakespeare for a living. 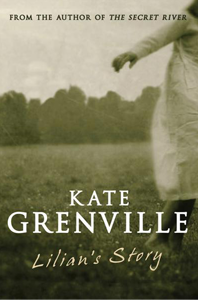 From Booker-shortlisted author Kate Grenville. This is the story of Lilian Singer, born on ‘a wild night in the year of Federation’ into a stifling household which totally fails to subdue her. Madness, cruelty and sexuality permeate the household but Lilian’s sights are set on education, love and – finally – her own transcendent forms of independence. Lilian Singer is, or becomes, that rare being: an eccentric true to her own self whose story reaches out to touch and delight the most discerning reader. She radiates energy and vitality through every page of this striking work. Lilian’s Story is the most loved and enduring of Kate Grenville’s fictional creations. Kate Grenville was born in Sydney and holds degrees from Sydney University and the University of Colorado. In 1984 her first book, a collection of stories – Bearded Ladies – was published. Since then she has published six novels and four books about the writing process. Her works of fiction have been published to acclaim in Australia and overseas and have won state and national awards and her books about the writing process are used in many writing courses in schools and universities. Much-loved novels such as Lilian’s Story (1985), Dark Places (1995) and Joan Makes History (1988) have become classics, admired by critics and general readers alike. The Secret River (2005) has won many prizes, including the Commonwealth Prize for Literature and the Christina Stead Prize, and has been an international best-seller. The Idea of Perfection (2000) won the Orange Prize. Kate Grenville lives in Sydney with her family.